Programs and products that make your store a wireless destination. Without question, mobile phones and devices are essential tools for everyday life. Consumers need these wireless devices to conduct personal and professional business, but they also need convenient ways to access what these tools offer. Our wireless products are the solutions to which they are turning. Use our products to capture the wireless customer at your store. We arm retailers, both national chains and independent stores, with the wireless products and services that cater to the consumer looking for convenience and flexibility. These wireless customers will come to your store for regular wireless purchases and top-ups and, as an added value, will make other in-store purchases. 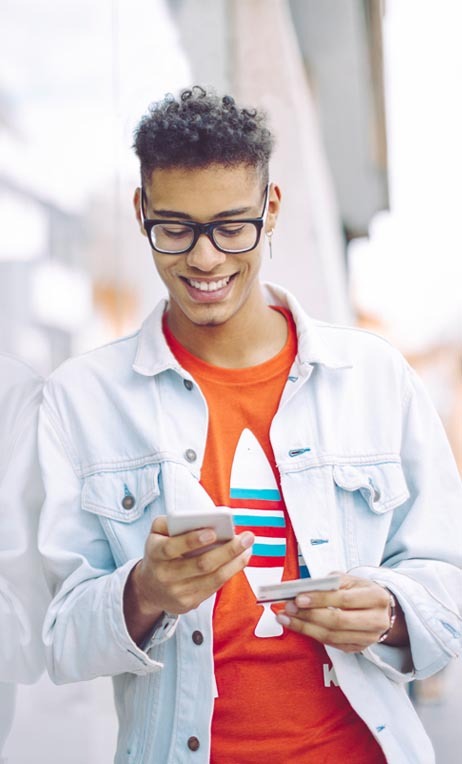 Our suite of products and services for national wireless retailers have become important solutions for meeting consumers’ everyday need of keeping in touch. Our SIM activation kits give consumers everything they need to use their unlocked mobile device, including a SIM card and a card for airtime. This technology unlocks handsets immediately when scanned at the point of sale. This makes your retail doors a destination for handset acquisition and top-ups. With an extensive suite of wireless top-up options at retail, we give consumers an easy way to top-up their account. We enable retailers to fully activate a customer device onto a carrier network, eliminating the need for the customer to call a 1-800 number for activation once they leave the store. We provide international mobile top-up cards that allow U.S. consumers to top-up accounts for friends and family located in other countries. Our assortment of wireless cards meet the unique demands of consumers and the varying capabilities of retailers' point-of-sale systems. This card solution allows the consumer to reuse their card inside your retail store to instantly top–up their account after activation. This technology gives retailers the ability to top–up consumer accounts instantly at the register using their mobile device number. Customers can request a PIN–on–receipt at check out and then top–up at their convenience. We provide independent wireless retailers with the solutions they need to turn their stores into destinations for consumers who rely on their products for everyday life. Offer more with innovative payment processing. By offering wireless bill payment at the point of sale, you can turn your store into a payment destination, attracting more consumers to your store and encouraging them to spend more money. Our automated kiosk payment solution makes it easy for consumers to pay their bills by accepting credit cards, debit cards, checks and cash in a variety of denominations. Using our payment interface, retailers can quickly offer consumers a broad assortment of digital gift cards in addition to wireless solutions. Using a versatile payment platform, we help independent retailers turn their stores into wireless payment destinations. This innovative service enables the retailer to expand its business and gives agents a variety of ways to drive revenue, fees and commissions. Our wireless products and services are supported by an industry-leading foundation of technologies that will help you build more value into every consumer transaction. We provide partners and cardholders with expert support through our call center.